Members to receive the Communion. SIR Geo. 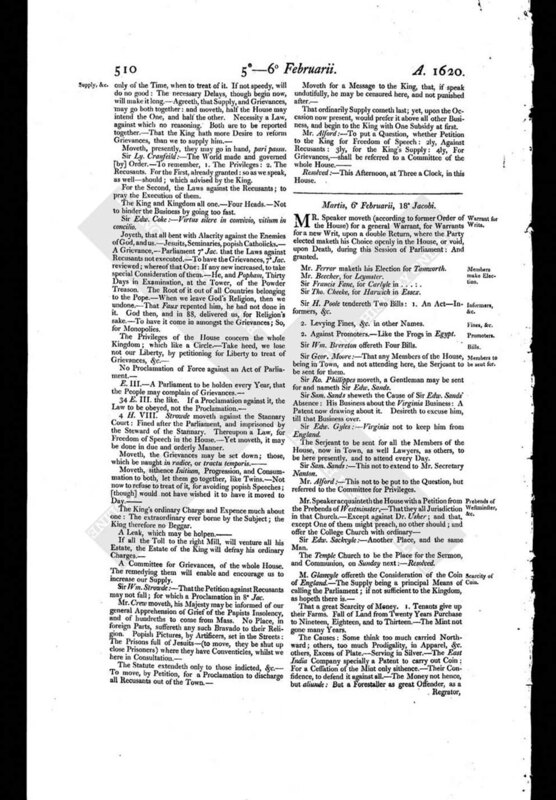 Moore maketh the first Motion, for a Committee for Returns, Elections,and Privileges: Offered Election, a Petition from the Borough of Gatton in Surrey. - Four chosen, and so returned to the Sheriff: He only certified One Return, and sealed not the Counterpart of the Indenture to the Borough for the other. Clifton, Sir Edw. Cecill, Sir Myles Fletewood, Sir Walter Earle, Sir Nath. Rich, Sir Charles Morrison, Sir Tho. Denton, Sir Jo. Heyward, Sir Talbott Bowes, Sir Ro. Floyde: - Exchequer Chamber, Two Clock, To-morrow; and every Tuesday and Thursday, during Parliament. Four Gentlemen; Sir Francis Barrington, Sir James Perrott, Sir Jerome Horsey, Sir Edw. Gyles, Sir Wm. Pitt, and the Clerk. - St. Margarett's Church, Westmynster, on Sunday next. Doctor Usher to preach, upon Question: The Clerk to give him Knowlege. Every Man, in Writing, his Name, and the Place, for which serveth. The former Order, last Session, to be observed. Sir Edw. Gyles: - Glory of God, King and Kingdom. - Moveth for Liberty of Speech. - Not to admit extravagant Speeches; but that to be punished here: - To petition his Majesty for it. 2. Many Popish Recusants in and about this City; many Multitudes of Jesuits, and Seminaries, ready for Mischief; hidden heretofore, now shew themselves; maintain Arguments openly. - Remembereth the Gunpowder Treason. - Their Malice increased with their Number. - Moveth, this House to be Petitioners to the King, for Redress hereof; for confined, by Law, from London. - Generally allowed a good Motion. Adviseth, where last Time a Carrier miscarried a Message to his Majesty, and he therewith offended - thereof hopeth none now. - Bishop of Lincolne. 1. A Reason of Honour and Memory to Ancestors, who, by their Care, left this Freedom to us. 2. That we derogate not - Not to do for Fear. 1. Honour of Preservation of the La\vs made by us. 2. For Preservation of the King, and his Posterity. To advance the good Ends abroad, Supply at home, moveth for a present Message to them. Mr. Speaker to keep the Orders of the House. The last the more pressing, and now a bleeding Business; therefore, though not usual, yet in respect of the Necessity and Rareness of the Case, to begin there first. The King hath striven to ease his Charge, loth to burthen his People. - Houshold,Navy,Ordnance, Ireland, &c. - The Crown not to be suffered to lie under this Burthen, without Help. - Dangerous, in Princes Cases : Contempt dangerous at home and abroad; dangerous, not for King only, but for Kingdom also. 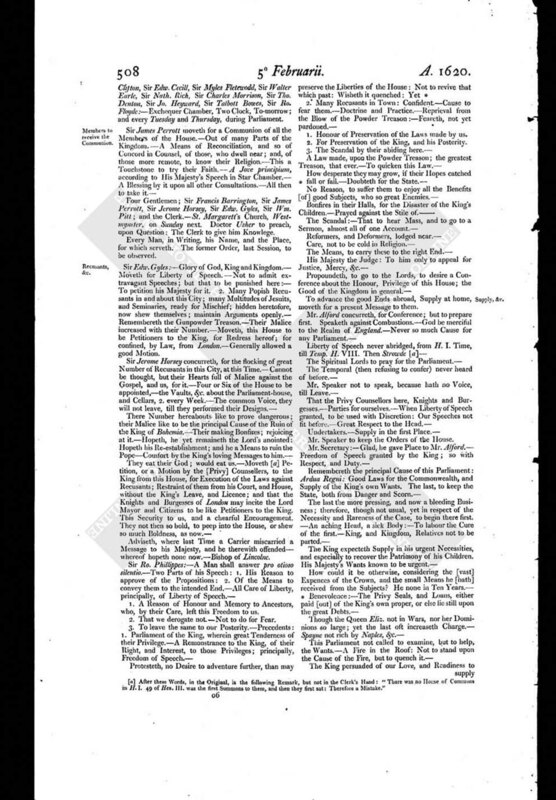 The second Cause, the Defence of the Palatinate; which was the First Cause of calling this Parliament. Though ths King, for many just Causes, hitherto a Neutral, for Bohemia, in respect of Conscience, Honour, &c. yet, for the other, resolved, if not by Treaty, yet by War, to regain the Palatynate. This admitteth no Delay; out of One Day, which may overthrow it. For our Grievances; many, and just. - No Body, without some Sores. - The King hath promised a gracious Hearing; and he, that will not then take hold of it, betrayeth his Country, for which trusted. Mr. Treasurer: - Beseech the honourable House to consider, that never any well-affected Subject had a greater Cause to be pressed to make Supply, for preventing of pressing Dangers. - No Doubt of Readiness, from the King, of Retribution. Royal and free Dealing with him, the best Means to work upon his royal Disposition. - Promiseth good Offices to the King: Whosoever doth not so, betrayeth King, and Kingdom. Though we begin it now, cannot end it now : Though we agree of Subsidies, yet great Time of drawing, reading, passing: - Commissions : - Levying, paying in, &c. - Addeth, for a Cause, this the greatest Occasion, sithence the Conquest: Four other: 1. For Recovery of the holy Land: 2. For redeeming of Rich. I. 3. For Recovery of Fraunce: 4. For saving Ireland. But the Recovery of [the] Palatinate greater. For Jerusalem; a perpetual [War,] for 100 Years, at least. H. II. gave 50,000 [Marks] at that Time: R. I. pawned all the Jewels and Demesnes of the Crown : All this to obey the Pope's Com' and imposture; which was, to recover the blessed Land, the Pope had cursed; but his End, to usurp upon their temporal Jurisdiction : We, for Palatynate, a just Title; they none. For the second of R. I. whose Ransom 150,000 Marks ; Plate of religious Houses, Chalices. This a noble Work, and better than the French; who left their King here, divers Years, unransomed. Religion not then in Question, as now. 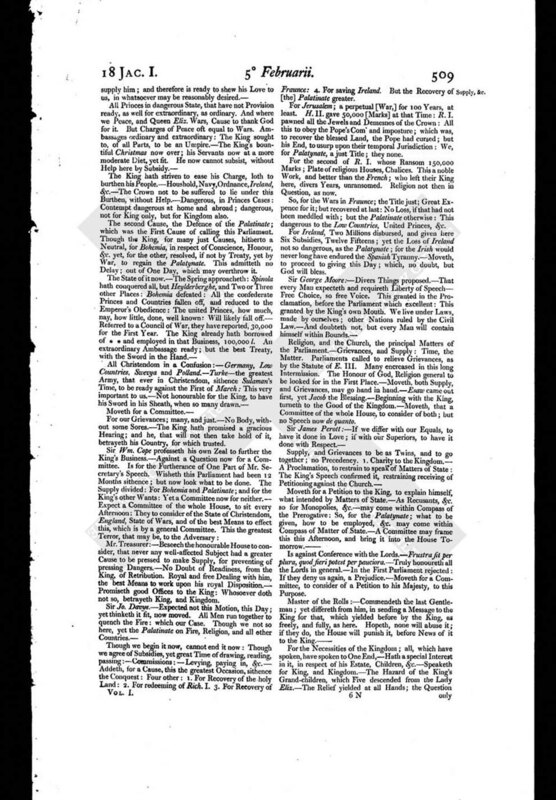 So, for the Wars in Fraunce; the Title just; Great Expence for it; but recovered at last: No Loss, if that had not been meddled with; but the Palatinate otherwise : This dangerous to the Low Countries, United Princes, &c.
For Ireland, Two Millions disbursed, and given here Six Subsidies, Twelve Fifteens ; yet the Loss of Ireland not so dangerous, as the Palatynate; for the Irish would never long have endured the Spanish Tyranny. - Moveth, to proceed to giving this Day ; which, no doubt, but God will bless. Religion, and the Church, the principal Matters of the Parliament. - Grievances, and Supply : Time, the Matter. 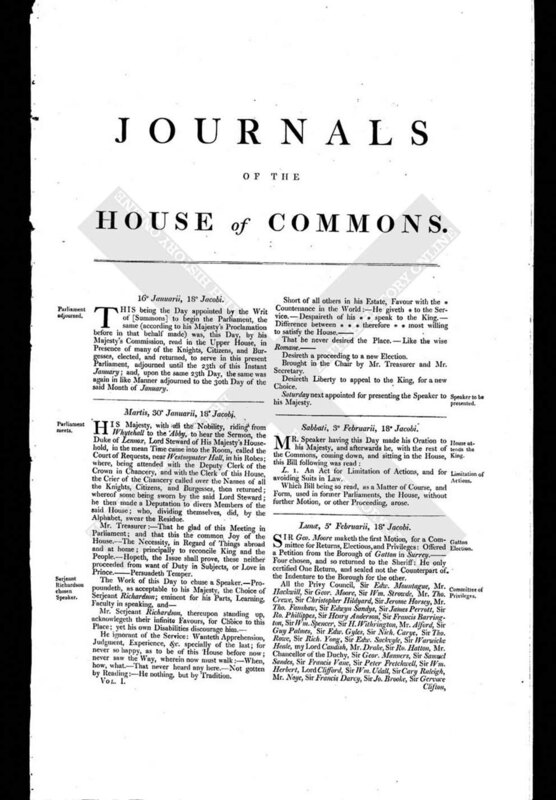 Parliaments called to relieve Grievances, as by the Statute of E. III. Many encreased in this long Intermission. The Honour of God, Religion general to be looked for in the First Place. - Moveth, both Supply, and Grievances, may go hand in hand. - Esaw came out first, yet Jacob the Blessing. - Beginning with the King, turneth to the Good of the Kingdom. - Moveth, that a Committee of the whole House, to consider of both ; but no Speech now de quanto. Is against Conference with the Lords. - Frustra fit per plura, quod fieri potest per pauciora. - Truly honoureth all the Lords in general. - In the First Parliament rejected : If they deny us again a Prejudice.- - Moveth fora Committee, to consider of a Petition to his Majesty, to this Purpose. Moveth, presently, they may go in hand, pari passu. Sir Ly. Cranfeild: - The World made and governed [by] Order. - To remember, 1. The Privileges: 2. The Recusants. For the first, already granted: so as we speak, as well - should ; which advised by the King. For the Second, the Laws against the Recusants; to pray the Execution of them. The King and Kingdom all one. - Four Heads. - Not to hinder the Business by going too fast. Sir Edw. Coke: - Virtus silere in convivio, vitium in concilia. Joyeth, that all bent with Alacrity against the Enemies of God, and us. - Jesuits. Seminaries, popish Catholicks. - A Grievance, - Parliament 7o Jac. that the Laws against Recusants not executed. - To have the Grievances, 7oJac. reviewed; whereof that One: If any new increased, to take special Consideration of them. - He, and Popham, Thirty Days in Examination, at the Tower, of the Powder Treason. The Root of it out of all Countries belonging to the Pope. - When we leave God's Religion, then we undone. - That Faux repented him, he had not done in it. God then, and in 88, delivered us, for Religion's sake. - To have it come in amongst the Grievances; So, for Monopolies. 4 H. VIII. Stowde moveth against the Stannary Court: Fined after the Parliament, and imprisoned by the Steward of the Stannary. Thereupon a Law, for Freedom of Speech in the House. - Yet moveth, it may be done in due and orderly Manner. The King's ordinary Charge and Expence much about one : The extraordinary ever borne by the Subject; the King therefore no Beggar. A Committee for Grievances, of the whole House. The remedying them will enable and encourage us to increase our Supply. Sir Wm. Strowde: - That the Petition against Recusants may not fall; for which a Proclamation in 8o Jac. That ordinarily Supply cometh last; yet, upon the Occasion now present, would prefer it above all other Business, and begin to the King with One Subsidy at first. Resolved: - This Afternoon, at Three a Clock, in this House.